Ulster have signed former New Zealand back-row forward Xavier Rush from Cardiff Blues on a two-year deal. The 32-year-old is Ulster's second major signing for next season with Johann Muller also set to join the Magners League team in July. "I'm looking forward to being part of a team that has some great young players and plenty of ambition," said Rush. "The five years I spent at Cardiff were terrific but I felt it was the right time for a change and a new challenge." He added: "Also, being on the right side of the Ulster fans for once is going to be great and I now look forward to making the move, getting out on the field and becoming an Ulsterman." The eight-times capped All Black left the Auckland Blues to join Cardiff in 2005, having captained the Auckland team to NPC success in 2002 and then victory in the Ranfurly Shield and Super 12 title in 2003. The Auckland born Rush made his international debut against Australia in 1998 and has, to date, made 96 appearances in the Magners League and Heineken Cup. "Xavier will be a great asset to the Ulster back row. He is an aggressive, attacking player, who has played his rugby at the highest level," said Ulster coach Brian McLaughlin. 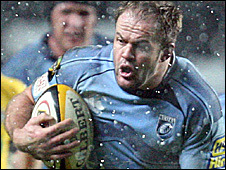 "He is a big hitter on the field and has been instrumental in Cardiff Blues' success in recent seasons. "The management team is delighted to have a player of Xavier's calibre join our squad ahead of next season. "The experience that Xavier will bring with him is of great value and importance to the Ulster squad now, and in terms of future team development. "Having players of his talent about helps raise the bar for everyone and develops our young players to the levels required to play Magners League and Heineken Cup rugby."